Until I embarked on my romantic comedy, Spray Painted Bananas, novel writing had begun to feel too much like self-inflicted torture. "Why do you write if you don't enjoy it?" my husband would say, as I banged my head on the keyboard and complained how hard it all was. I don't know when the transition happened. When I was 11, I'm sure I was very happy writing my novels about talking animals. If I hadn't been, I would have gone out to play instead. Somewhere along the way, the pressure of wanting to succeed in the industry had eroded away my enjoyment of the art. I was trying very hard, but I wasn't having much fun. Spray Painted Bananas brought back the fun for me. I wrote it as a serialised novel on the online platform Wattpad, after their publicist promised to feature it on their front page. I love romantic comedies, both watching and reading them, and I set out determined to create something upbeat and funny. The idea was inspired by an evening at a conceptual art gallery; one of those exhibitions full of random broken objects and paintings you'd easily mix up with those of your 3 year old child's if it wasn't for the price label. The main character is Amber, a broke temp working in a catering firm in London, who after years of scrounging free wine from wacky art gallery openings with her best friend Farrell, decides there’s no reason she can’t become a conceptual artist herself. A chance meeting with a wealthy, young art curator, Elliott Frinton-Smith, sets things off in a desirable direction, and all Amber needs is a brilliant idea to grab the attention of the nation. Enter bananas! I won't tell you any more or I'll spoil it for you. But I am happy to share the news that it's been very well received online and after racking up over a million hits, attracted the interest of a literary agent who I signed with earlier this year. I think that might be a sign that I write better when I'm having fun! Spray Painted Bananas is still available to read on Wattpad for free, so if you fancy a giggle and a warm, fuzzy feeling, over Christmas, check it out. I hope you enjoy it as much as I enjoyed writing it; without a doubt it's the most fun I've ever had writing a book. 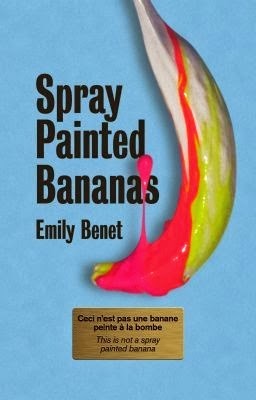 How I see it, you can't be a tortured writer if your novel features spray painted bananas, can you?